Micromax launched its new flagship smartphone Canvas Doodle 2 A240, the successor of the Canvas Doodle A111 is now available in India. The Doodle 2 A240 comes with a 5.7 inch HD IPS display with the resolution of 1280x720 pixels. It runs on Android 4.2 Jelly Bean operating system and powered by 1.2 GHz quad-core processor with 1 GB RAM. 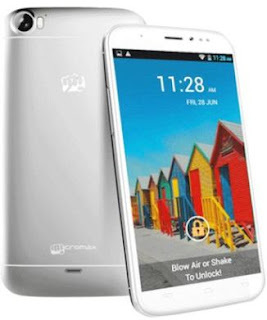 Micromax Canvas Doodle 2 has 12 GB of internal memory and expandable memory up to 32 GB with microSD cards. The phone features a 12 MP rear camera with dual LED flash, auto focus and 1080p video recording options and also 5 MP front facing camera. It comes with Dual Sim support, Smart Pause, Video Pinning, Blow Air to Unlock features and preloaded apps like M!Doodle. The phone packed with 2600 mAh battery and the connectivity options are 3G, Wi-Fi, Bluetooth and GPS. Canvas Doodle 2 A240 is priced at Rs.19990 and it is available on Saholic online store. It will be hit the stores from this week.